One of my husband’s favorite past time is to reorganize and optimize our living/working space(s). That was what we did yesterday on a grey and rainy afternoon (after bringing some stuff to recycle and donate). 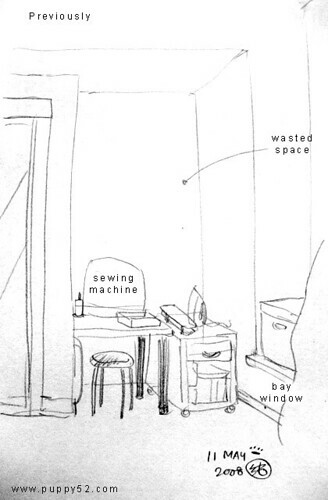 So this was my sewing corner, the “before” state — forgot to take a photo before moving things around LOL so did a quick doodle. Why don’t you put some posters up there?